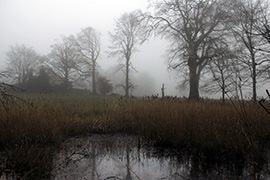 This website is the property of J&L Grubb Ltd, registered company number 104066 Trading as Cashel Farmhouse Cheesemakers. 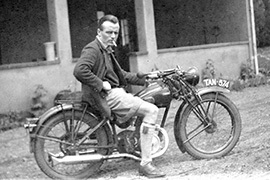 All material on this website is copyright to J&L Grubb Ltd, and may not be reproduced without permission. All orders under €100 are subject to a €10 delivery charge to anywhere on the Island of Ireland. We use an overnight third party courier for delivery in Ireland, the maximum time between dispatch and receipt is 48hours. Orders are dispatched Tuesday, Wednesday and Thursday for next day delivery, at busy times such as Christmas delivery may take 48 hours. Please note Thursday dispatch is only to main cities: Cork, Dublin, Limerick, Waterford, Galway. Future dates can also be selected. Deliveries are made during working hours Tuesday to Friday 9 till 5, please ensure there is someone available to take receipt of your cheese parcel. Orders placed from Friday to Sunday inclusive will be dispatched on the Monday and typically delivered on the Tuesday, or Wednesday latest. You will receive an email letting you know that the delivery is on the way. In the event of extreme weather or other events out of our control (eg civil actions, delivery vehicle breakdown etc) we cannot be responsible for any delivery delays. Once you place your order, we will review it and put it through for processing. If we notice any missing information or anticipate any issues, we will get in touch with you to ask further questions. Otherwise we will deliver as soon as possible. Your payment is taken as you place your order so you will always be charged at the rate advertised at the point of ordering. Products may be withdrawn for sale from this website at any stage without prior notification. We also reserve the right to amend prices of products without prior notification. All prices on this website are in Euro, and that is what will be debited from your debit / credit card. 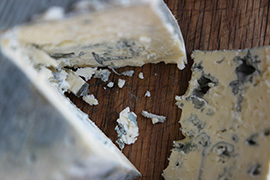 If you are purchasing using a non-Euro credit card, the relevant exchange rate is applied by your bank and not by J&L Grubb Ltd.
Quality of product is central to everything we do here at Cashel Farmhouse Cheesemakers, it is our intention that our cheese should reach you in great condition. Perishable products will be delivered to you in an insulated box, with cooler packs, we would urge you to re-use these. Upon receipt please open your box and refrigerate your perishable items at between 0-5C, each product will carry a use by date which will guide you regarding when products need to be consumed by. 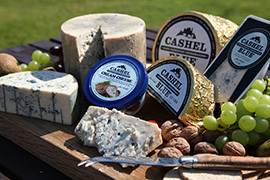 If your cheese parcel should arrive damaged, to such an extent that the outer box’s structure has been compromised, i.e open or split, we would kindly ask you to phone us on the day of delivery without delay: TEL: 052 6131151 or alternatively e-mail info@cashelblue.com. Delayed deliveries due to weather problems. Gifts to recipients who have gone away or are unable to receive parcels. 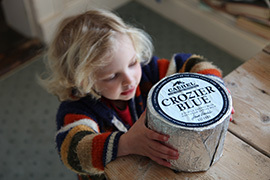 Taste Quality: If, for some reason, you are not satisfied with the taste quality of your product, please can you contact info@cashelblue.com outlining the flavor profile and providing us with the traceability code of the cheese, this is found on the under label and will read for example 230303. We endeavour to provide a fair description of our cheeses in our descriptive and if for some reason this falls wide of your expectations, product will be replaced, please note where appropriate goods will only be replaced once. We don’t ask you to return anything perishable but may ask for non perishable products to be returned to us and if so we will reimburse you for postage. We accept payment online by credit card using Bank of Ireland EVO payment systems. Your payment is processed via a fully authorised Payment Service which ensures that all your information remains totally confidential. In fact we never see any of the card numbers ourselves. Payment is taken as you place your order and if the payment does not authorise successfully, your order will not be successfully processed. Please check that you receive not only a confirmation of your order but also a confirmation of your payment by email. If you have not received one of these, your order may not be placed successfully. J&L Grubb Ltd trading as Cashel Farmhouse Cheesemakers reserve the right not to accept or to cancel any order once accepted, without penalty. Credit card numbers are not retained after payment has been received. We undertake to not sell any of your personal information, name, e-mail, address, telephone number to any third party. J&L Grubb Ltd. respect your privacy as a visitor to our website. We recognise your need for us to explain what data we collect, how we collect it and what we do with this data. We will abide by the various data protection laws. We will collect personal data such as name, address, email address, telephone numbers etc. This is so we can fulfil your order or contact you back if you have filled out our Contact Form or Visitor Booking Form. We will only contact you if (a) there is a problem or issue with your order, (b) if you have contacted us through our website’s Contact Form or Visitor Booking Form, or (c) you have agreed to be sent marketing collateral. We will also collect non personal data which we will ordinarily use for statistical purposes. This is to help us better understand customer patterns and to help us serve our customer needs on this website in the future. Examples of this non personal data include browser details, demographic data and statistics. Data will be collected by monitoring Internet Protocol (IP) Addresses. This gives us details about your Internet Service Provider, and not you as an individual. As with many online businesses, we may also use an external statistics provider to analyse trends on this website (such as Google Analytics). You will be given the option to our dairy newsletter. Should you wish to receive this via e-mail we will never pass your details on to any external third party, unless we have specific permission from you to do so. You may opt-out of our mailing list at any time. Where you leave our website via a hyperlink to a different website (external link), we cannot be held responsible for the contents of the external website. We may use non-personal data (such as statistics and demographics) when giving information on the website as a whole, for example to prospective advertisers. We reserve the right to pass on personal data if the business is sold. We reserve the right to update or modify these Terms and Conditions at any time without prior notice. For this reason, we encourage you to review these Terms and Conditions whenever you purchase products from us or use our Web Site.